Endlessly fashionable rolled 14k gold plate 1-1/4" hoops may be worn with all beads and gemstones as shown, with your combinations of choice, or plain! Rolled gold plating means that the gold goes all the way through the hoops and is stronger and more long wearing than goldfill. We have used Arkansas natural matched grade A jewelry quality rock crystals with pretty channel faces along with Chinese turquoise, African turquoise, and all 14k gold plated beads and findings. 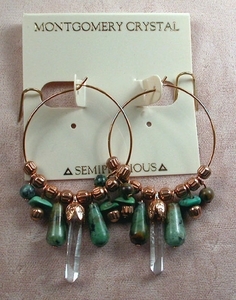 They extend 2-1/4" from the top of the hoops to the crystals' points. Light weight lets you wear them all day.